On the last day of vacation, I went to the beach early in the morning to do a quiet time. As I sat and watched the waves roll in and out, I embraced the moment to just be with God. At that very moment, I looked up at the sky. Immediately my eyes landed on a tiny rainbow poking out from some clouds. I quickly got out my camera, took a picture of it, and then literally watched it disappear before my eyes. Baffled by the timing, I felt the Lord impress me to read the story about Noah. As I read, I realized that God was literally answering my written prayer. He gave me a reminder of his heart so that I could be diligent of lining up my feet. In Genesis 6-8, we read the biblical account of the earth and its wickedness. The Lord saw the constant evil inclination of the human heart. The wickedness “deeply troubled” God causing God to regret the creation of humanity. In God’s justice, God decided to destroy the human race. But in God’s mercy, Noah and his family found favor. Scriptures indicate Noah was righteous, blameless, and walked faithfully with God. Therefore, God commissioned Noah to build an ark, take in animals, and thus survive the flood to come. Noah “did everything just as God commanded him” (Gen. 6:22). After revealing the covenant between God and Noah (will discuss in a minute), God releases a rainbow of the sign of the covenant (more to follow) between God and humanity. As I read the passage and reflected on my prayer to hear His heart, God reminded me of his eyes that are for the whole earth. We worship a cosmic, global God who is capable of seeing the individual in the midst of the cosmos. There I sat on the beach with Creator God using a rainbow to direct me in my devotions and talk to me about his plans for the earth. After the destruction of humanity, God issues again the command to be fruitful, increase in number and fill the earth. But the next part of the passage is where God further grabbed my attention. Narrative theology is where God uses story to teach us something about His character, His values, His purposes. In the big story of the Bible, we find numerous stories that reveal the overall character, values, and purposes of God. In the account of Noah, God reveals the value he places on life. In Genesis 9:5, God says, “I will demand an accounting for the life of another human being.” Instantly my mind thought of the 40 million babies killed annually around the earth (almost 115,000 per day) through abortion. God will demand an accounting of every single one of those lives lost. Why? Genesis 9:6 goes on to explain, “For in the image of God has God made humankind.” (Oh, Lord, show me how to speak courageously for the voiceless and decrease the deaths of the unborn!). At this point, I was very tempted to think about 10/40’s curriculum Voice for the Voiceless and God’s plans with it but hey, I was devoting here, not making organizational decisions! So, I got back to devoting… and read about the first rainbow to appear in the sky and its purposes. The rainbow is a message from God – not only to us but also for God. God gives the rainbow as a sign of the covenant He makes with the earth, “I have sent my bow in the clouds, and it will be a sign of the covenant between me and the earth.” Over the years, I have seen the rainbow and remembered God’s promise. But look what God says is also the purpose of the rainbow. The rainbow appears in the clouds to help God remember to not destroy the earth by a flood again due to the wickedness of humanity! So the rainbow is a gift to us to remind us of God’s covenant, but it also serves to remind God to not destroy the whole earth by a flood, regardless of the wickedness of humanity. The rainbow points to God’s intense holiness. And on the beach that day, the character of God’s holiness stabilized my heart. Regardless of what laws or rules or values a culture has on the earth, God’s character of righteousness sets the bar. God’s ways do not shift. No matter what our culture says or even those claiming to follow God say about morality; God’s character is sure, certain, perfect, good, faithful and unchanging. My job as God’s follower is to grow in my understanding of God’s character and then ask God to transform me by renewing the image of the Creator in me (Col. 3:10). The rainbow can remind me that in the midst of God’s holiness and right to destroy the earth, God also has a character of patience. He allows the world to continue because of his patience and his desire to extend his grace and mercy to more people and to the remaining unreached people groups. I couldn’t remember the passage and thought, “Oh, this may take me forever to find the reference.” But upon turning to Revelation, my eyes looked down and I immediately saw the word “rainbow” in Revelation 4. God clearly wanted to continue the lesson about a rainbow in this quiet time! Did you know the throne of God is surrounded by a rainbow that shines like an emerald? Just imagine. A rainbow encircles the throne of the King of Kings. From the throne comes flashes of lightening, rumbling and peals of thunder. And before the throne there was “what looked like a sea of glass, clear as crystal.” I sat looking at the ocean envisioning this throne as a rainbow encircled it. I kept reading. Twenty-four elders surround the throne and say, “Holy, Holy, Holy is the Lord God Almighty; who was, and is, and is come to come.” God is praised for his constant character of holiness for all times. God’s holiness proceeds out to his holy love, holy justice, holy compassion, holy mercy, and on and on. The elders lay their crowns before the throne and say, “You are worthy, our Lord and God, to receive glory and honor and power.” Why? Why is God worthy to receive glory? Answer: “For you created all things, and by your will they were created and have their being.” Did you see that? God is worthy because He created all things, all humanity. Again, God as Creator creates life. He sustains life. A rainbow shines out in both Genesis and Revelation. Rainbows point to both a sign of God’s holiness and also of the covenant to not destroy the earth by flood because of humanity’s wickedness. Both Genesis and Revelation refer to God as the Giver and Source of life. In Genesis he demands an account for every human killed and in Revelation he is worshipped for giving life to all. The rainbow is not just for people. It also serves as a reminder to God to have patience with humanity so that others might be saved. On the beach that day, God reminded me of his constant character. He reiterated in my heart his global concern for the earth – both it’s wickedness and his desire to reconcile the earth by his blood. God reminded me again of his holiness and how the rainbow holds him back from judging the earth too soon, thus preventing some to not come to repentance. God warns humanity to not grieve the Holy Spirit of God. The rainbow is a sign in both Genesis and Revelation that points to the holiness of God. A misuse of this image by either Christians or non-Christians could grieve the Holy Spirit of God. 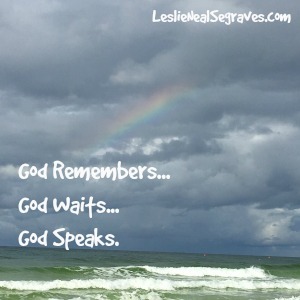 As I knew my time with the Lord was drawing to a close because I needed to get back to my kids and husband, I asked, “Lord, today, did you send me that personal rainbow as a reminder of your personal love for me? 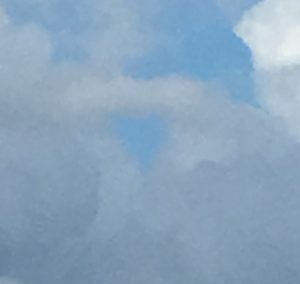 A divine love pat on the back?” At that very instance, my eyes gazed upwards in the sky, and in the midst of the clouds, I saw a little blue piece of sky in the shape of a heart. I saw it, snapped a photo and within seconds, it also disappeared before my eyes. Jesus loves to communicate. If only I were always available to hear. But my desire is for my feet to point in the direction of God’s heart all the days of my life.